Shameless commerce | Name-Brand Ketchup. Yesterday my sister bought me a package of peanut butter M&Ms. Tell me that is not Donald Trump on the front. A morning show for grownups? 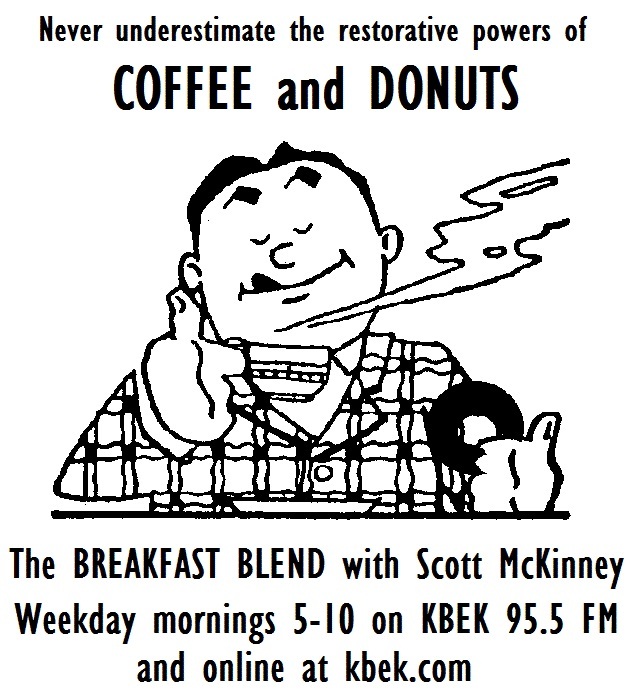 The Breakfast Blend with Scott McKinney is the morning show for people who have families, make decisions for households, work hard, pay bills, stay informed, and are part of their community. People who take care of responsibilities, enjoy creative music and good conversation – and still know how to have fun. The Breakfast Blend is smart and funny, without shoving jokes and outrageousness in your ears for five solid hours. No off-color language. No prank phone calls. And no whoopee cushions. The Breakfast Blend isn’t just the regular grind. It’s the morning show for grownups. I’m contemplating a new slogan to drum up freelance writing gigs. These and other fine words can be found in Roget’s Thesaurus. I put a “tip jar” on my sidebar. Tacky? Maybe, I dunno. Bad form? Possibly. Annoying? Geez, I hope not. Over the years I’ve ponied up a few bucks in tip jars for a number of blogs I’ve really enjoyed. I figure that if I met the blogger in person, I’d want to treat him or her to a beer (or their libation of choice) to say thanks. This is kind of like doing that. The proceeds aren’t going to some exotic charity like “Save The Unicorns” or “Teh Dyslexic Fnud.” No, this is good old-fashioned Gordon Gekko greed. There are home repairs I must make before the Minnesota winter sets in, and everything I spend on that gets diverted from my upcoming Vision Quest. Filthy avarice, pure and simple. But I’ll hoist a Pop Shoppe beverage in your honor in Cape Breton, I’ll post updates from the road, and I won’t freeze this winter. Pledge Drive Premium: If you hit the tip jar before October, and PayPal allows you to post your mailing address, and you feel safe to do it, go for it. (I promise I won’t sell you to a mailing list.) And I’ll mail you a witty, side-splittingly hilarious postcard all the way from Nova Scotia. Via reliable Canada Post, eh. Suitable for framing. After October, well, I’ll think of something else. No pressure. We’ll still be friends, no matter what. But if you find this blog entertaining and thought-provoking, you’ll have my sincere, eternal, undying thanks if you hit the tip jar. Plus a Canadian post card. Beauty.